Circular and elliptical arches are a beautiful addition to any home with arched doorways or windows. Arch casings for round top or-elliptical windows and doors can be manufactured from MDF for paint grade or solid wood for staining. They can be tricky to measure, so be sure to follow these guidelines to get the correct fit. Measure the width of your opening along the flat section. This will be the maximum width of your arch. Record this number. Hold a tape measure across the opening. Keeping the ends of the tape level, slowly move it up until you see the measurement decrease. Move the tape back down to the point where it returns to your measurement from step one. This is the point where your arch begins to curve. Mark this point. Measure the height from this point to the top center of your opening. This measurement is the height of your arch. You now need to add the reveal to your measurements. Add this once to the height and twice to the width (once for each side). For manufactured windows, these measurements are all you need. For any non-machined arches, you will need to include a template. Trace your arch on heavy paper, bristol board, or cardboard. This will allow us to match the shape of your arch. *If you want arches for both sides of a doorway, please provide two well-labelled templates. This is important, as measurements are usually different on each side of a doorway constructed on the job site. 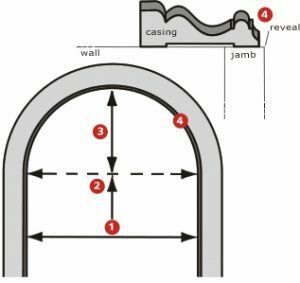 We ask that if you choose to provide us with measurements for your arch casing (instead of providing a template) that you are confident that the arch is completely symmetrical to ensure a proper fit. Please fill out a copy of the Arch Order Form and send it by fax or email. If using a PC, simply click on the link, fill out the sheet, ‘Save as’ and attach it to your email.